a patient from behind one of the check-in desks. SIOUX CENTER – Patients no longer have to navigate a construction zone as they come into Promise Community Health Center. For the past month, reception staff occupied desks in the waiting area as the remodeling project was being completed. Now, the front reception remodeling project is mostly finished. The remodeling project ensued in late July following completion of a 3,000-square-foot expansion project on the east side of Promise’s building in downtown Sioux Center – increasing the health center’s space by about 60 percent. Nancy Dykstra, executive director for Promise, noted that the building project was designed to enhance the “patient-centered medical home goals” of Promise. 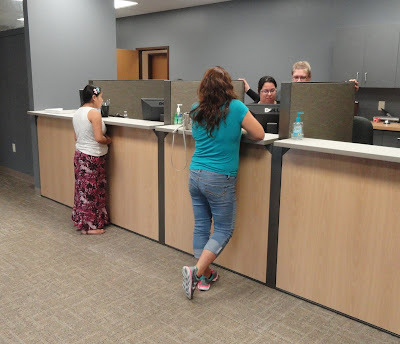 In particular, patients will notice the benefit to them in the remodeled front reception area. “When they enter the building, they will find more room in our reception area, and they will find a more welcoming, patient-friendly environment,” she said. Promise's outreach staff about various needs. Also as part of the remodeling project, a two-unit work pod for the medical providers in the clinic area was redone with a more open feel. 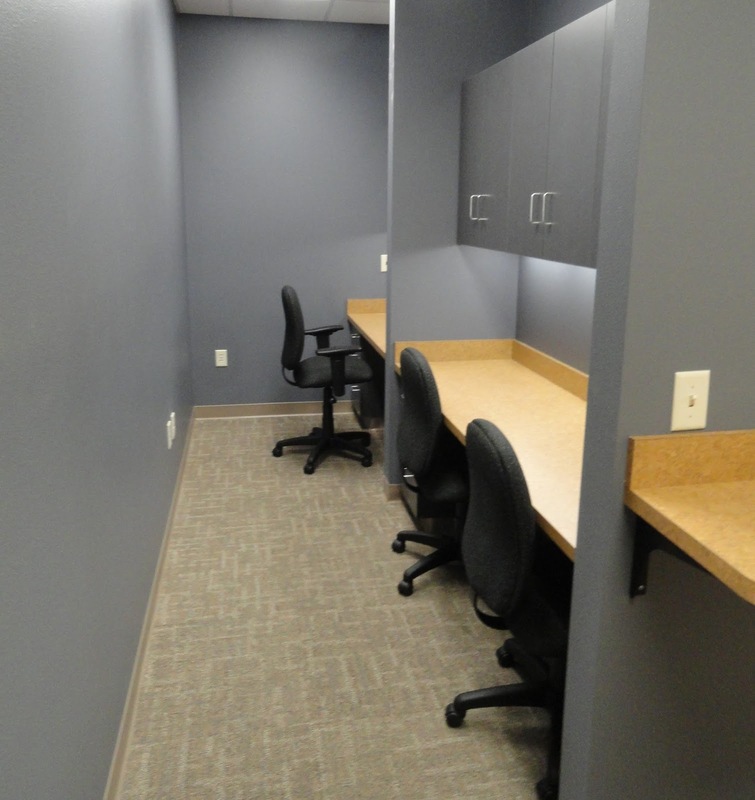 The former break room also was converted into two back-to-back work pods for clinical staff. Promise’s medical providers, nurses and behavioral health personnel will work out of those areas. Promise still is equipping and furnishing a few areas, some painting needs to be finished and some exterior improvements will be completed, but the most of the work outlined in the remodeling project has been checked off the list. staff will move into this area soon. Staff moved into the expansion area in late June. That portion of the project included a community education/conference room, a prenatal/OB wing with a two-unit work pod and two exams rooms, a behavioral health therapy room, four administrative staff offices, and an employee break room. For more information and a photo tour of the expansion area, click here. The expansion and renovation project was made possible thanks to a $250,000 federal capital improvement grant awarded in August 2015. SIOUX CENTER – Promise Community Health Center of Sioux Center has been awarded $44,438 in federal funding to recognize its achievements in providing high-quality, comprehensive care. The Health Resources and Services Administration announced Tuesday that Promise was among 1,153 health centers in all 50 states, the District of Columbia and seven U.S. territories to receive $63.3 million in Health Center Quality Improvement Grants under the Affordable Care Act for fiscal year 2015-16.
funding for high-quality, comprehensive care. The health centers receiving the grants are being recognized for high levels of performance in various categories. They will use the funds to expand current quality improvement systems and infrastructure and improve primary care service delivery in the communities they serve. Promise was awarded $20,000 in the Access Enhancers Awards category for increasing the number of patients served between 2013 and 2014. Just two of the 14 community health centers in Iowa were recognized with that award. Nationwide, 340 health centers received about $9.7 million in the category. Promise was awarded $15,000 in the Electronic Health Records Reporters Awards category for using EHRs to report clinical quality measure data on all of its patients. Nine health centers in Iowa were recognized with that award. Nationwide, 491 health centers received about $7.3 million in the category. Promise was awarded $9,438 in the Clinical Quality Improver Awards category for demonstrating improvements in one or more clinical measures. All 14 community health centers in Iowa were recognized with that award. Nationwide, 993 health centers received about $19.7 million in the category. In total, the $44,438 awarded to Promise was the sixth most of the 14 community health centers in Iowa even though it is the second smallest in patients served. HRSA acting administrator Jim Macrae said the grants award health centers that are achieving the highest levels of clinical quality performance and improvement. “The awards will help health centers continue to provide comprehensive primary care to the nation’s most vulnerable communities,” Macrae said. Promise is among more than 1,300 community health centers that provide care to nearly 23 million patients nationwide. For a list of Quality Improvement Awards recipients for fiscal year 2015-16, click here. Block Party on Wednesday, Aug. 12. 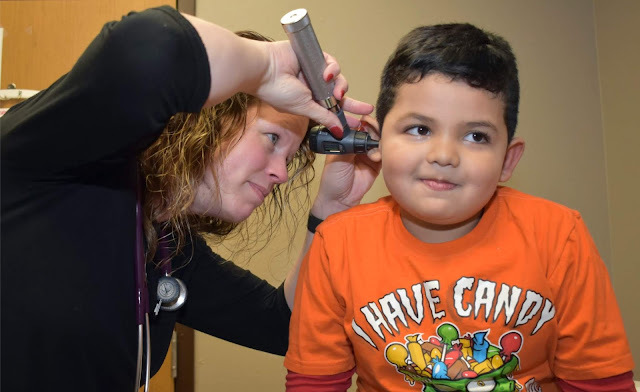 SIOUX CENTER – A record 126 children were served with required screenings for school during Promise Community Health Center’s sixth annual Back-to-School Block Party on Wednesday, Aug. 12. This number topped the 2014 total of 104 children. The 2015 event was offered again this year in celebration of National Health Center Week. "We were thrilled to offer this service to our community to help ensure that students are ready to return to school," said Derrick Vander Waal, public relations and development coordinator for Promise. "We were pleased to see so many families turn out to not only receive the screenings but also to have a good time with their families." As a breakdown of this year’s numbers, 40 youths were given free immunizations, 57 had free dental screens and 93 received low-cost school and sports physicals. All of those were all-time high marks. offered during the block party celebration. Free drawstring bags filled with school and hygiene supplies also were given to the children. Promise staff conducted an internal fund drive for the bags. The children, their families and many others from the community also enjoyed block party activities in the parking area and alley behind the health center during the four-hour event with the help of many Sioux Center area businesses and organizations. Promise and nearly a dozen local organizations offered interactive and educational games and activities. The activities included caricature drawings for a self-esteem activity, face painting, skee ball, healthy after-school snacks, sidewalk chalk and bubbles, coloring and crafts. KSOU Radio served a free hot dog meal, Culver’s gave out free lemon ice treats, Cinema 5 Theatres provided free popcorn, and McDonald’s donated apple slices and Go-Gurt yogurt. As one service, Sioux Center Health offered car seat safety checks. Twenty car seats were checked, and 12 new ones were given out. Only one seat did not need to have any adjustment made to it in the vehicle. 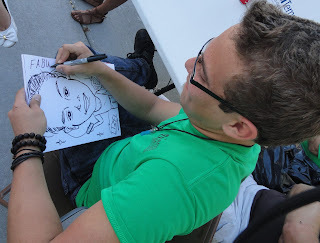 a self-esteem activity during the block party. The Walmart Foundation helped make the event possible with a $500 grant. Jacob Bossman, regional director for U.S. Sen. Chuck Grassley, visited and took a tour of Promise during the event. He was impressed by the growth Promise has experienced in programs, facilities and services and by the number of children and families attending the Back-to-School Block Party. To see many photos from the event, check out multiple posts on Promise’s Facebook page at www.facebook.com/PromiseCHC. SIOUX CENTER – What does Nikki Fischer hope to bring to Promise Community Health Center in Sioux Center? 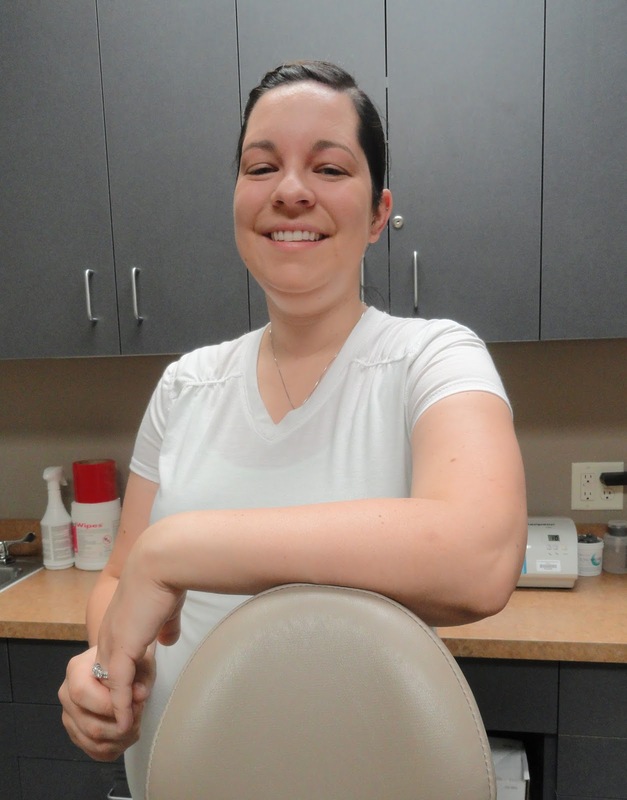 Fischer has started serving a dental assistant at Promise. She was interested in working for Promise because she enjoys helping diverse cultures and populations. Fischer, who grew up in Sioux Center and graduated of Sioux Center High School in 2009, said she always had a desire to go into the health field, but she’s “too squeamish” to be a nurse. So, she figured the dental field would be the way to go. She earned her associates of applied science degree in dental assisting from Kirkwood Community College in Cedar Rapids in 2010. She then served as a dental assistant at Pediatric Dentistry of Coralville, June 2011-July 2012, and Orange City Dentistry, Sept. 2012-July 2015, before starting at Promise. Her primary tasks as a dental assistant at Promise will be to assist the dentist, Dr. Kenneth Tjeerdsma, and help to educate patients in all aspects of dentistry, ranging from a procedure being done to proper hygiene techniques. “The most rewarding is seeing people smile and being able to make a difference in people’s lives,” Fischer said. Nikki Fischer and her husband, Dan, have a daughter, Paisley, 3, and another baby on the way. They live in Sioux Center. She enjoys spending time with her family, going to the pool with her daughter and baking.